Day 1 - Arrive in Las Vegas, Nevada. Transfer to your hotel. A get acquainted/re-acquainted dinner together, for those who wish. Others may choose to go out to one of the many terrific Las Vegas shows. We'll help you on your way, if you do. Day 2 - To the South Rim of the Grand Canyon, where we spend the next two nights. 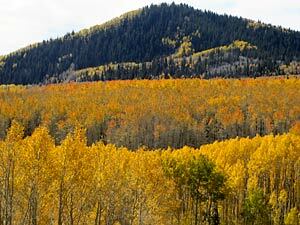 The drive takes us through desert, grasslands and timber; and from just above sea level to 7,000 feet! Day 3 - Our day will be spent by the Grand Canyon! This huge-beyond-belief canyon is as awesome and colorful as you have ever imagined and you'll love the accessible views. 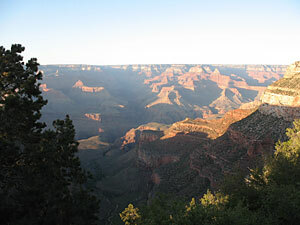 We'll also drive a few miles down to Tusayan, to see a spectacular IMAX Grand Canyon movie. Day 4 - Drive east along the south rim of the Grand Canyon. Out of the park we’ll stop at Cameron Indian Trading Post, on the Navajo Indian Reservation for lunch, then head for beautiful Lake Powell, where our hotel overlooks the lake. 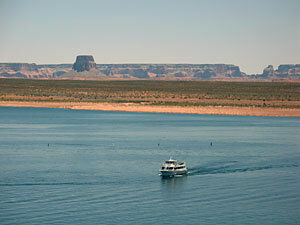 Day 5 - You'll take the Canyons Adventure Boat Cruise on Lake Powell this morning! Blue waters against the red sandstone -- spectacular! After lunch we continue our journey to Zion National Park, so magnificent, and one of the nation's oldest, where we stay two nights in Zion Canyon at Zion Lodge. Day 6 - One of the great things about Zion is that Zion Canyon is closed to motor vehicles unless staying at Zion Lodge, in which case vehicles can drive that far only. This means that there isn't pollution, noise environmental degradation due to traffic. However, there are accessible shuttle busses that are quiet and clean running for us to hop on. In the morning, we'll take a shuttle to the end of the road up the canyon, then enjoy Riverside Walk, a mile-long paved path up the canyon, next to the Virgin River. After we return, we'll have lunch and the balance of the afternoon will be yours to enjoy, whether it's to just admire the scenery, enjoy one of the paths, read or write a novel. Day 7 - Off to Bryce Canyon National Park, where the myriad spectacular rock formations and bright pink colors must be seen to be believed! Stay one night. Day 8 - We drive north to Salt Lake City today, through mountains, hills, valleys with farms and ranches, and rural communities. Later, our farewell dinner. Day 9 - Depart from the West today with unforgettable memories. Specially included: Arrival dinner; All admissions; Scenic Boat Ride; Farewell dinner. Access Tours is a 501(c)(3) educational non-profit organization, funded by gifts, donations, and proceeds from tours. You are invited to make a tax-deductible donation by contacting us. Donations can be in the form of stocks, cash, or anything of value, such as a vehicle or equipment.